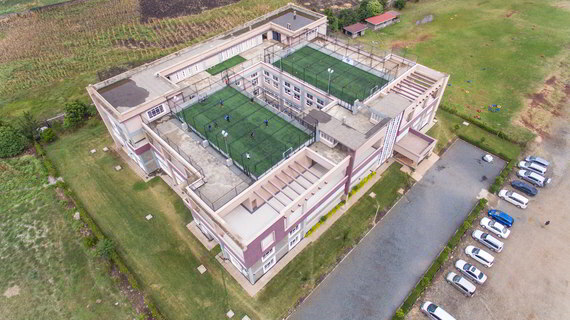 The Turf on Top 5-aside football fields are located on the top of the International Christian Center (ICC) Connection Center in Imara Daima. Could you ever imagine it? Well, maybe not in Nairobi, on top of a church building. But Yes! They are! Two Turf-on-Top 5 -aside football fields atop the International Christian Center (ICC) Connection Center in Imara Daima. On September 2, 2108, Ambassadors Football and International Christian Center braved a launch of an innovative, first of a kind concept in Kenya that featured two football fields on top of a building. The spectacle 5-aside football fields are constructed on top of International Christian Center (ICC) Connection Center in Imara Daima which is Home to the Ambassadors Football Training Centre. Kenya has yet to see football fields located on top of a building. Not only this, the turf on the football fields are of the highest quality with world standards. They are also fully lit during the day and at night and ready for play. ICC Imara Daima Campus envisioned using every bit of space available to seve the local community and they creatively picked the roof to demonstrate the pasion the church has for safe playing fields. All these serve one vision of bringinging hope through football creating safe and friendly environment to play and a training ground to envision and empower others to use football as a tool for social change. During the launch of the two fields, the KAG General Superintendent, Bishop Philip Kitoto reiterated on the importance of partnerships in building Ambassadors Football vision to transform society and nations. The launch was also graced by Rev Leo Kinuthis who is the head of Creating the Future as well as Julie MAtiba Wahome who is the chairperson of Ambassadors Football Kenya and Ambassadors Football Global board member.
" Today, the vision of Ambassadors Football to teranform individuals and communities through local football outreach comes to life through prayer hardwork and partnerships as the very first Ambassadors Football training center in Africa is set up," said Julie who was excited at the prospect of going into the second phase, a fully lit soccer field thatwill icrease outreac to local and global communities. The field can be rented for the following activities: Football training, Football matches, Tournaments, Outdoor games & activities, Birthday parties, Wedding photos, Team building activities. Cost: KES 3,000 per hour or package deals for events.